I recently came across this on Pinterest. Could this be any more true in my life? A year ago today, a chapter ended that I didn't want to end. I didn't see how there was going to be a happy ending if that chapter was over. I knew it could happen, but I just didn't see how just yet. I am so thankful for time. For perspective. For healing. Fast forward from that day one year ago to today. I am immeasurably thankful that chapter is over. Because I didn't know it then, but there was a much more amazing story to be written in my life, and last year's chapter had to end so this one could begin. Days like today are such a good reminder to me that the Lord is ultimately in control and truly does have a bigger and better plan than we can see. Even now I'm sure I don't know what seeds are being planted today in order that they might blossom beautifully in the days to come. Either way, I can trust the heartbreaks, joys, disappointments, and celebrations in life to the God of both individual moments and the whole picture. He has a plan for the highest highs and the lowest lows and is weaving them together in our lives for his glory. How I respond to them is the only part I can control, and how I choose to face each day can bring even more glory to him. What a great reminder that the Lord is always at work, fulfilling his plan for me that he will be glorified! 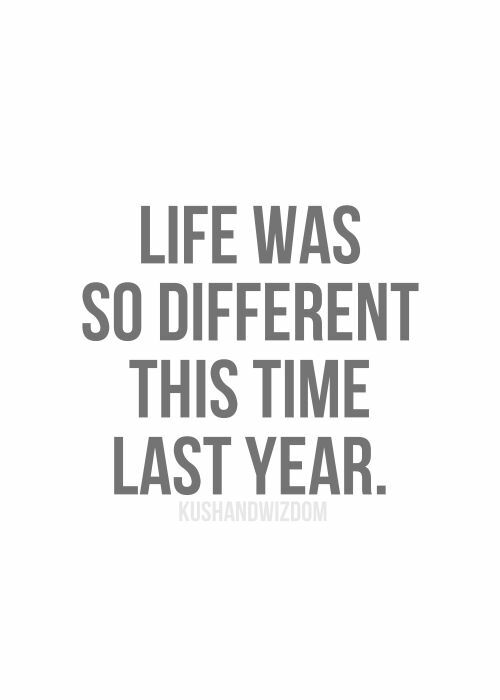 So how was this time last year different for you? Can you see how the Lord was writing a beautiful story in your life? Are you choosing to glorify the Lord in the midst of whatever it is you're facing today, looking forward to being able to see the bigger picture as time goes on and perspective changes?